The ex-chief of South Korea's most popular chat app has resigned after being accused of failing to prevent child abuse imagery being spread via the service. Kakao Corp announced Sirgoo Lee's departure a week after he was charged, but not detained, by prosecutors. Mr Lee had been in charge of the KakaoTalk app until August, when he moved to an advisory role. The company says that its chat app has more than 100 million users. "Lee said he would like to take on new challenges," Kakao Corp said in a statement provided to the Korea Herald newspaper, adding that he was scheduled to formally step down on Saturday. A spokesman later added that: "Mr Lee's departure is in no way related to the allegations. Mr Lee had been weighing his options since the new CEO was announced in August 2015, and the timing is merely coincidental." Last week's indictment was the first time the South Korean authorities had charged an internet industry insider with violating the country's Protection of Children and Juveniles from Sexual Abuse Act. The law says mobile service operators must take adequate steps to stop child abuse photos and videos circulating on their platforms, but does not set out specific measures they must take. KakaoTalk allows users to hold both one-to-one and group conversations and to send multimedia content to each other, and thus hosts a huge amount of data. The allegations about the illegal images, however, related to Kakao Group, an online community serviced by the firm. The company had indicated it had taken steps to tackle illegal material. "We are making a genuine effort, by scanning for keywords, looking for malicious links, and allowing users to report objectionable material," the company told the Hankyoreh news site last week. "But requiring us to filter out even more obscene material on a private service necessarily implies a degree of censorship that would infringe on the privacy of users." The indictment will likely raise concerns at other chat apps, which have also had problems tackling youngsters swapping sexually explicit images of themselves and others. 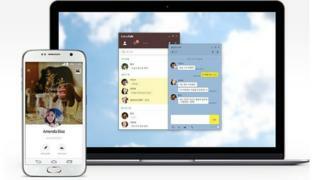 KakaoTalk has previously been criticised for not doing enough to protect its members' information. Last year, it faced a user backlash after it emerged that it was handing over communications logs to local authorities on a regular basis. That led to a U-turn, and in October the firm said it would stop complying with wiretapping warrants.